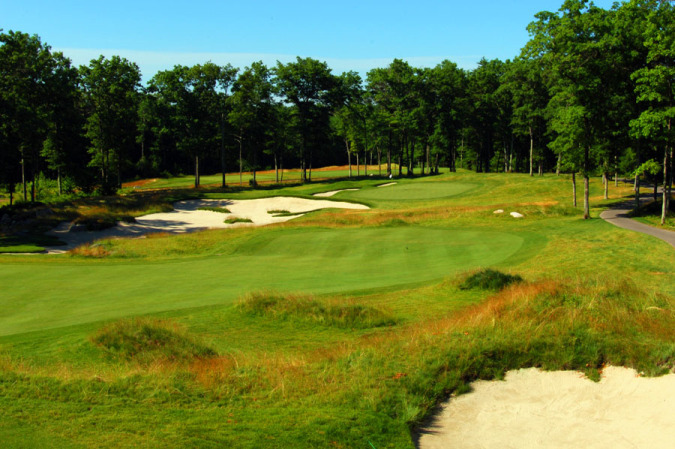 The PGA Tour moves to TPC Boston for this week's Deutsche Bank Championship and longtime readers know they can relive many of the past posts showing the redesign work by Gil Hanse, Brad Faxon and Jim Wagner under the topic TPC Boston. PGATour.com has a nice hole-by-hole guide with photos and hole renderings. And then there are the before-afters from six(!) years ago, including holes one, four, five, seven, eight, nine, ten, fifteen, sixteen, seventeen and the recently renovated eighteenth green. Gil: “We just wanted to create a little more interesting finish." Rex Hoggard talks to Gil Hanse about being called a rooster Luke Donald's 18th green complaints and the TPC Boston rebuilder makes clear that interest was emphasized over difficulty. For the week, the 18th is playing harder statistically. Last year the hole played to a 4.50 average with 19 eagles, 165 birdies and 23 bogeys. Through three rounds this year the hole has a 4.650 average, 14 eagles, 106 birdies and 28 bogeys. Finally, a visual look at the change to the TPC Boston's home hole green courtesy of Golf Channel's first round broadcast of the Deutsche Bank Championship. Not a huge change from afar but several details standout: the approach area over the wetlands allowing for a shot to land and release, the short grass area to the rear, and the loss of green left where most players bailed out. It was clear for Hanse and even the million amateur architects who are out there that was there was a simple way for the big boys to play the 18th – drive it into a wide fairway and then launch your second shot from anywhere between 190 and 230 yards. If you were wide left or long, no worries; you had a basic wedge shot out of thick rough and getting it up-and-down was hardly needed for creative talents. No more, not with shaved-down areas left and long and when balls bounced through the green or wide of the green, you will have a number of style options – putt it, try and flop it off a tight lie, or pitch it into the slope and get it on that way. But if the homework was done during practice rounds, players know that the swales are steep – especially left. Chances are, many of those in this week’s Deutsche Bank Championship field will figure it out. After all, we can’t sue for false advertisement because indeed, these guys are good. But Hanse knows when a group of tour players gather, they can’t come to a consensus on what day it is, so don’t expect universal agreement on the work done to the 18th green. We'll find out Friday in round one of the Deutsche Bank Championship. Gil Hanse, Jim Wagner and Brad Faxon along with TPC Boston superintendent Tom Brodeur will be unveiling their latest change to the host site for the Deutsche Bank Championship. It's a long overdue renovation of the 18th green, a remnant of the mostly-abandoned Arnold Palmer design and modified to match the other greens on the course that have been rebuilt (but there's still a ways to go to do all 18). Brad Klein describes the changes to the green. From there, the old green was miles wide, and because Tour-quality players rarely hit short (they just miss it right or left), there was little question they’d get home, Now that more of a question since the new green, 30 percent smaller and perched, brings more trouble into play, including wetlands on the right that had hardly been relevant before. Tom Layman in the Boston Herald talks about the new green, including the square footage reduction from 6,500 to 4,100 and even talks to a few players about the change. “It’s interesting, very interesting,” said Jason Day, who has two top-five finishes at the Deutsche Bank the past two seasons and is 88th in the FedEx Cup playoff standings entering the tournament. “I’ve talked to a couple of guys, but there’s obviously mixed thoughts. If I was a new guy and this was my first year on tour and you’ve never played the course before, 18 would just look like a tough second shot hitting into that green. Of the 918 ranked holes on the PGA Tour last year, only 26 were easier than the 530-yard, par-5 finishing hole at TPC Boston. The scoring average was 4.5 during last year’s tournament, and it has been the lowest-scoring hole on the course ever since the event became part of the FedEx Cup playoffs in 2007. A New England Sports Network report hosted by Alexandra Grace looks at tournament enhancements, with quite a bit of video footage looking at the new 18th along with an insightful interview of the club GM, Brad Williams. I had the video embedded, but it automatically played the ad everytime you opened my page. So tacky, especially since the NESN owners don't have to pay Adrian, Carl and Josh's salaries any longer! 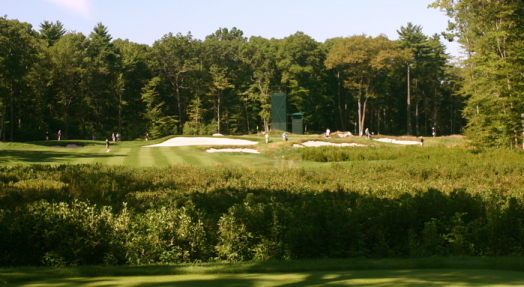 For more on the TPC Boston, including before-after shots of other holes and analysis from last year when I was at the event, check out the Topics page for TPC Boston. When Does A Driveable Par 4 Become Just A Long Par 3? I love TPC Boston's short par-4 fourth because a Deutsche Bank spectator can still hang out there, see a variety of shots and every few groups witness something special. But with modern distances surging in the five years since Gil Hanse and Brad Faxon unveiled this replacement hole on the site of the old fourth hole, the character has changed due to forces out of the architect's control. This revamp debuted last year but this is the first time I've had a chance to see what Gil Hanse, Brad Faxon and Jim Wagner cooked up for their remodel of the second green. I must say, television does not do this one justice. I definitely plan to spend some time there as the Deutsche Bank kicks off. And not just because it's so close to the media center. The green is located in the same spot as the Palmer designed green, with the bail-out area changed from a giant drainage catch basin to a more level and natural look. 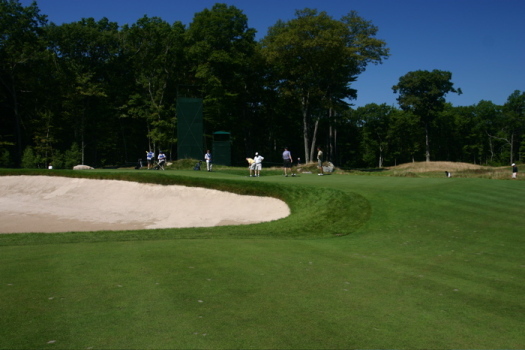 But check out what golfers face if they do bail away from this reachable par-5 green (click on the images to enlarge). (Above) left side lay up view, note how the "bump" creates problems. From above the bail out...what a wild shot! “I said, ‘Tim, I know everybody thinks it’s bad, but I’m in the middle of it. And this is really bad. You need to start rethinking a lot of things.’"
You may recall at last year's Deutsche Bank how CEO Seth Waugh shocked the scribes by openly voicing his displeasure with the tour kicking in a purse increase as the banking industry was melting down. Deutsche Bank Out As Boston Sponsor? Tom Gorman reports "that after a seven-year run Deutsche Bank is stepping aside as title sponsor of the Bay State’s only PGA Tour event." The de-Floridaization of TPC Boston continued last fall, winter and spring, with Gil Hanse, Jim Wagner and Brad Faxon continuing to inject more of a New England feel after their successful renovation that debuted two years ago. "Nobody in the world’s going to want to take 70 million less." 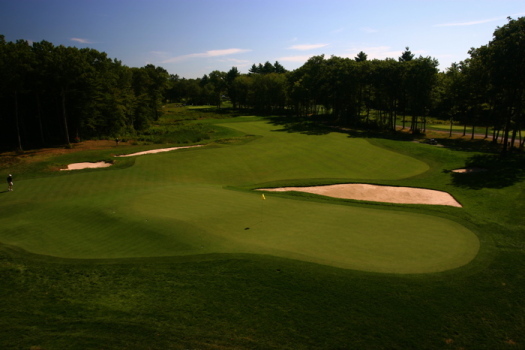 Jim Wagner filled me in with a few more specifics about the minor work done at TPC Boston. Most of this won't show up on television, but I can say it makes a huge difference in making the greens feel a bit more naked and giving the golf course an older feel. It was interesting how many players didn't care for the tee shot options on No. 18 last year, so the expansion should help the shorter hitters a bit. Here's No. 10 with some of the rear containment mounding that should be gone. 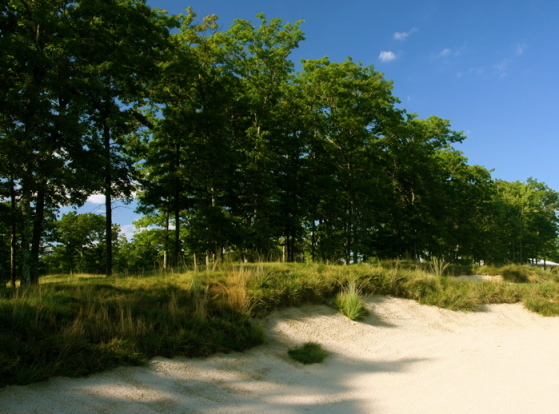 Now posted at GolfDigest.com, Jack Nicklaus and Tom Doak's Sebonack takes the private category. The Best New Public With Hot Beverage Cart Girls Over $75 goes to Virginia's Highland Course at Primland by Donald Steel and Martin Ebert. Best New Public Where You Might Have To Change Shoes In The Parking Lot Under $75 goes to another Virginia course, Ed Carton's Spring Creek. The Best New Public Remodel, Lester George's restoration of The Greenbrier, beats out in stunning fifth place position, the horrid Industry Hills, aka Misery Hills, oh, wait, it's been rebranded as Industry HIlls GC at Pacific Palms Resort. I think the rebranding put it in the top 5. Best New Private Remodel, goes to Gil Hanse, Brad Faxon and Jim Wagner for their revitalization of TPC Boston, edging out Rees Jones remodels of Bellerive and Atlanta Athletic Club as well as Jack Nicklaus's work at Ohio State. And Best New Canadian goes to Muskoka Bay by Doug Carrick. Stephen Szurlej's exclusive photos of the winners are posted, but other than the aerials of Sebonack I wouldn't waste your time unless you want to see a bunch of TPC Boston ground views from behind greens guarded by lakes. Not as horrific as his photo of Rustic Canyon when it won, which actually was taken by a blind ground squirrel. However, considering how easy the two courses are to photograph (I know, I'm biased) and considering the landscape photography work of folks like Lambrecht, Dost, Brown, the Henebry's, Cuban, Furore and Scalletti, Golf Digest should farm this assignment out. While not award winning, at least some of these images give you a sense of why TPC Boston edged out some tough competition. "I don't have much good to say about 18"
View of No. 18's bunkering (click to enlarge)You throw a bunker in the center of the fairway and our boys can't deal with it! And people wonder why we get slaughtered in the Ryder Cup. The pot bunker that's been added into the middle of the layup area at the par-5 18th offers a quaint look. The only thing is, does it come into play? "It definitely did for me," said Kuchar, who only drove it 240 yards and was left with about 290 yards. For sure, Kuchar had to consider the deep pot bunker on his layup, but he executed it perfectly. "I don't have much good to say about 18," he said. . . Tim Herron told Gil Hanse, who led the redesign efforts, that he didn't like the pot bunker. It was right where he would want to lay it up, Herron told Hanse, who nodded and replied that's why it was put there, to force guys to be precise with their second shots . . .
FYI, the sprinkler head on the back side of the bunker, closest to the green, is 95 to the center of the green. 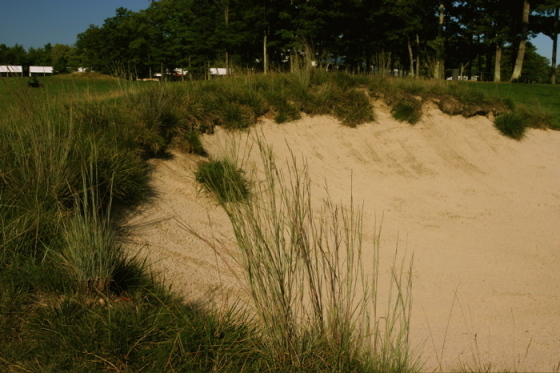 The nearest head short of the bunker is marked 117. Yes, they might have to hit an easy pitching wedge instead of a full SW.
Oh, and there's a good 15 paces of fairway on either side of this little bunker. What a menace to society! At least Rocco, who actually gives this stuff serious consideration, likes what he sees. As for the overall changes to TPC Boston, Rocco Mediate is a big fan. "Fax did a great job," said Mediate, a reference to PGA Tour colleague Brad Faxon, who consulted with Hanse on the redesign. "Then again, I knew he would. He's old-school, so he wasn't going to force some new-fandangled goofy stuff." ...the brand platforming experts down in Ponte Vedra will note TPC Boston 4th hole's impact on day one Deutsche Bank play. Tiger Woods's double bogey 6 and Phil Mickelson's eagle 2 were run on sports highlight shows across the country. I did notice that TGC/NBC showed it quite a bit more than any other front nine hole. Q. You talked about the new hole at No. 4. Can you give me your general impressions of that hole beyond the birdie? CAMILO VILLEGAS: Tricky one. It's a tricky one. There's obviously -- the green just goes away. I think we should play that hole from the front tee all week, just because from the back tee it's a little too funky. You're going to be hitting maybe a 5-wood into a very narrow space, and it's going to be hard to even hold the green from 100 yards, and then if you hit driver and you get it up there where you have 50 yards, you can be in the middle of the fairway and I don't think you're going to be able to hold the green. It's a tricky one. It's a good hole from the front, I believe, and I'm just trying to get it over that green somehow and just chip it back up. Q. Can you talk about the 4th hole? TIGER WOODS: Yeah, the 4th hole I was telling Stevie, we've got to be committed to hitting the ball right of the green. I could hit the ball 50 yards right of the green. I was just trying to hit the ball right, right, right, and I just pulled it about five yards left of the flag. I was in the bunker, the only place you can't be. Q. We couldn't see it from where we were standing. What were you trying to do with that shot? TIGER WOODS: I was just trying to keep the ball on the green. Trying to keep it on the green. Q. Runs away from you? TIGER WOODS: Yeah, big-time. I wasn't even trying to get cute with it. I said, well, if I make a mistake, make this mistake long, hit the ball over the green, chip back and try and make par that way. It just came out soft and buried under the lip. Q. Still in the sand? TIGER WOODS: It was actually underneath the lip, so I couldn't get it out. Q. So you liked everything? MIKE WEIR: I liked everything, yeah (laughter). I heard that No. 4, that that was kind of a narrow tee shot and a big -- I like the drivable par 4s because you miss it in the wrong spot with these firm, fast greens, and you're going to be struggling for par. Good risk-reward hole. Q. As an example, and I could ask this of someone who had an eight-foot eagle putt, where could you miss it where you do get in some deep doo-doo? MIKE WEIR: Left. I played with J.J. and he hit it left, and he had to hit it just right to get it barely on the green, and he hit a good shot and it rolled all the way down the hill and he had to make a really good up-and-down for par. That's a really good hole. If you miss it in the wrong spot, even though he was in the fairway you don't have much. Even if you miss it right, you can pitch it up the green. 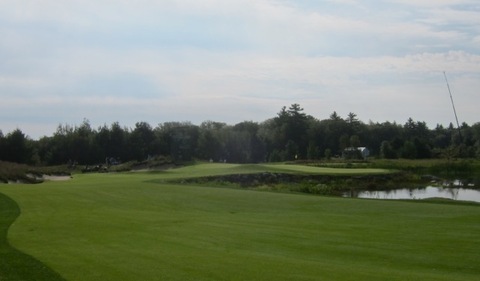 "We'll play the up tees"
Jim McCabe offers an extensive look into the TPC Boston's renovated 4th hole and looks at some of the issues that arose over how the PGA Tour would set up the short two-shotter. As expected, the Hanse-Faxon-Wagner redesign of TPC Boston's 4th hole is generating the most discussion, fueled in part by the possibility that officials may play the 356-yard tee for two rounds. Since that tee was never intended to be used for Deutsche Bank tournament play, it appears the Tour officials have decided to play it at around 300 yards all four days. Until we see actual tournament play, we won't know which option players will most often chose to take. Just from observing some play on it, the hole looks like a Redan merged with elements of Riviera's 10th. It seems that a few will lay-up with a four or five iron, most will hit three wood at the front opening or into the front bunker, while some will take driver and err on the long side of the green. A few images, starting with the view from the tee. And the view from the right center, which is the ideal layup angle. Finally, the rear view which flattens out some of the neat features over the green (fall off, bumps, etc...) that may make the player driving it long think twice. There are some small mounds meant to look like the old style New England bumps that are often found in this area when crews would bury large rocks instead of trying to cart them off property. Thanks to favorable weather and the efforts of superintendent Tom Brodeur, the course is dry and firm with a promising weather forecast. I toured the course today with Gil Hanse and Brad Faxon, so it was fun not only to hear their insights, but to hear player reactions which included several fine compliments along the lines of "I'm not sure how to play this hole" or "that bunker is right where I want to layup." Of course, the players don't realize they are paying the architects a compliment! The new fourth is a real standout and I'll post more on that with some photos when I get the chance. Both 16 and 17 could be really fun on television, while the 18th is loaded with trouble but until the original green is blown up, I'm not sure how great it can be. Most exciting of all is how aged the fescues already look. These images are of 5 month old bunkers. In a few years when the grasses break down and see a little wear and tear, they'll only take on more of an antique flavor.